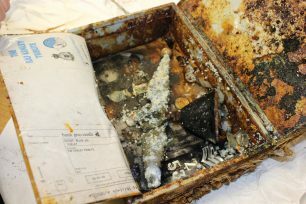 As the RAF Kenley tribute relocation works enter their final stages we at Kenley Revival HQ were incredibly fortunate to open up the original time capsule and take a first look at an object and its contents which has been buried for 17 years. The original time capsule was buried when the RAF Kenley tribute was installed in 2000 and was put together by the RAF Kenley tribute committee. The committee crowd funded the money required to design, build and install the RAF Kenley tribute and continue to raise funds annually to this day to pay for repairs. The Kenley Revival Project Manager and the Chairman of the RAF Kenley tribute committee were the first to take a glimpse at the time capsule as its surfaced for the first time since it was buried. 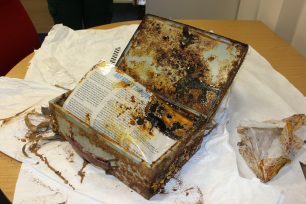 So what does an unearthed time capsule look like? 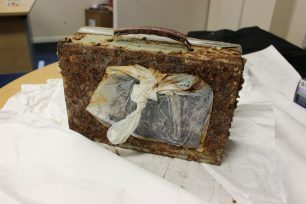 As you can see the time capsule used was a metal suitcase and incredibly the plastic bag attached to the side was very well intact which just shows how long plastic lasts. This made for a very interesting discovery as we unearthed within the plastic bag the original plaque with the date stamp from Rowland Brothers who built and installed the RAF Kenley tribute. What we found inside were a number of coins including shillings, a policeman’s badge and a metal RAF object which we believe may be a gyroscope or a decorative piece. Unfortunately the condition of the contents of the time capsule wasn’t great as a result of water ingress but it captures really well the passion for the funding of the RAF Kenley tribute and the enthusiasm within the community to keep these memories alive for future generations. We will be burying a new time capsule shortly with permission and content supplied by the RAF Kenley tribute committee documenting the history of its origins and those who helped fund its creation. We will also be burying information regarding the project and the partners in the hope that when it will be unearthed in the future, people will be able to understand the history of the RAF Kenley tribute and the significant role it has played and will continue to play in its relocation to allow restoration of the spine wall and therefore in the telling of RAF Kenley’s history. We’ll be documenting the new time capsule so watch this space!